It seems that we are in the third epoch of theaters. It all began with grand old movie houses at the turn of the last century. Home theater came into its own at the end of the last century, but much of the technology was really in its infancy. Today, home theaters have evolved, again. Today, home theaters are as much about binge-watching House of Cards on Netflix as gathering the family together for a screening of Frozen. Indeed, the home theater is also becoming the gaming environment to play the latest Assassin’s Creed release. The home theater is the perfect environment for these expanded functions, because the home theater is an immersive environment, combining senses of sight and sound. Home theaters are increasingly becoming flex spaces, hybrid theater environments, combining billiards, bar, or wine tasting with a more casual viewing and entertaining experience. 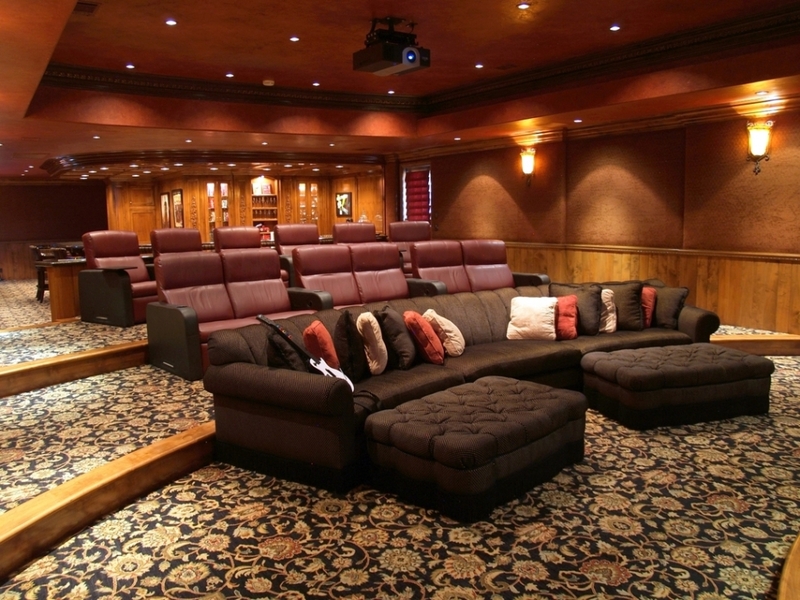 Home theaters incorporate a complex array of technology. The home theater designer’s toolbox has also expanded as the home theater environment has hybridized. Of course, every home theater requires a quality projector, projection screen, and surround sound speakers, but the technology is really more complex than that. Every home theater begins with a design. The design scales in complexity with the complexity of the finished system. A proper dedicated theater requires a great deal of forethought. That surround sound system requires acoustical treatments, absorptive, reflective, and isolating materials to balance out the acoustical performance of the environment. That projector needs to be prewired with the appropriate cables, which now includes network for internet access, and the projector needs to be mounted. A projector can be hung from the ceiling or placed on a shelf in a built-out soffit. Ideally, the projector must be acoustically isolated to eliminate fan noise, and the projector needs a dedicated exhaust system to keep cool, as the lamps do get hot. The projector has to be placed at the proper height and distance from the screen to display properly on the projection screen. The projector has to have an appropriate brightness for the home theater environment it is being placed in. If there are windows, or if it is a flex space, a brighter projector may be indicated. Light control technology for windows and lighting is recommended. Projection screens may be fixed, static screens that are always mounted flat on the display wall, or they may be motorized recessed screens dropping down from the ceiling when needed and closing up in the ceiling to reveal a secondary television display. Of course, there are too many makers of projectors, screens, and speakers to name. Stewart Filmscreen, Draper, and Screen Innovations all make projection screens for the home theater environment. Sony, JVC, Sim2, and many others make home theater projectors. JBL is our favorite of the multiplicity of speaker manufacturers for the home theater. Home theater technology in the third epoch of cinema does not end with projectors, projection screens, and speakers. Theater seats are an essential piece in the home theater mosaic. Of course, you or your interior designer might prefer to have cozy couches or even a bed in your modern home theater, but the motorized theater recliner remains the best technology for home theater seating. We recommend a mix of recliners and love seats for flexibility. Home theater seating can be augmented with bass shakers, devices that shake the seat in concert with the action on the screen. Bass shakers take the experience of watching your favorite action movie or playing your favorite action video game to new heights above and beyond what the subwoofers can provide. Of course, if you are using the home theater as a gaming environment, your home theater will be outfitted with your preferred console and controllers. Future home theater designs may incorporate space for virtual reality. If you are still only dreaming of one day adding a theater to your home, your home theater may one day incorporate an Oculus Rift virtual reality headset with a Virtuix Omni virtual reality treadmill to take your home theater to the fourth epoch of home theater technology. Did I just blow your mind? Give us a call today. If you couldn’t tell, we are excited about home theater technology.